This entry was posted in Africa ICT4D Information and Communication Technologies Living Labs Meteo data Uncategorized on July 5, 2016 by Anna Bon. From 20 to 24 June 2016, the W4RA team was in Gourcy, Burkina Faso a facilitated a new ICT4D requirements engineering workshop with farmers-innovators of the Yatenga and Zondoma regions, Burkina Faso. The workshop was organized and hosted by W4RA’s local partner, the NGO Réseau MARP. The workshop was dedicated to the theme of meteorology. 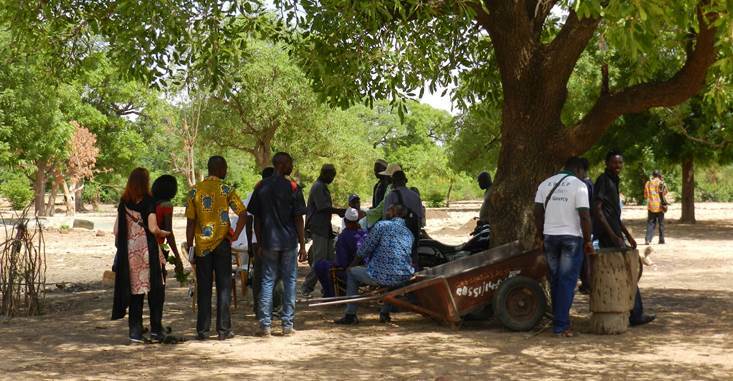 Why is meteorology so important for farmers in Burkina Faso? Information on rainfall is extremely important according to the farmers we spoke with, who practice rain-fed agriculture. The rainy season in this region starts normally in June and ends in September. Knowing the timing and quantity of rainfall is important for farmers to plan your cropping calendars and take decisions which seeds to choose. A rule of thumb, as we heard from the farmers here, is that you should start seeding as soon as 20 cm of rain has fallen in the month of June. But how would a farmer receive this information? As we know, the World Wide Web is full of resources on meteorology, some are open access other sites provide paid meteorological services. The Burkina Faso meteorological service produces numerous surveys on actual rainfall. Meteorological services in the world collect and publish weather data on a daily basis. However, one needs an information channel (computer, smartphone, internet, radio, tv) to find and retrieve this data. ICT4D researcher Francis Dittoh presenting at the workshop. The farmers who participated in our workshop did not have computers or smartphones. They speak Mooré, a local language. The have mobile phones, but do not read sms. The conclusion from the group sessions was that farmers want mobile voice-based meteo information, accessible using their simple, voice-based mobile phones, in spoken language, in their own language Mooré. Group work by the farmers-innovators during the workshop. This need for contextualized voice-based information services did not surprise us. 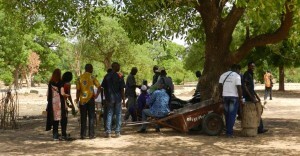 During many workshops done by the W4RA team in the past few years in West-Africa, similar observations were made: e.g. in 2010 in Ouagadougou, 2011 in Segou, Tominian, Bankass, Bandiagara (Mali), Ouahigouya, Gourcy (Burkina Faso), Tongo-Beo, Yameriga (Ghana), 2012 Konobougou, San, Tominian (Mali), 2014 again in Segou, Gourcy, Ouahigouya, and in Guabuliga and Zanlerigu (Ghana), 2015 in Bamako (Mali), in 2016 Kokelet (Mali). 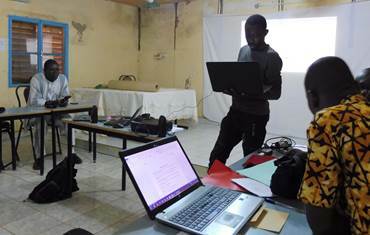 During this workshop in Gourcy, the W4RA team showed several prototypes of information services that were developed by VU students and partners organization 2CoolMonkeys, based on local user requirements. The Kasadaka, a small prototyping platform for voice-based services, and the voice-based Weather Service, developed by students from VU, specifically for this rural African context, was very interesting, according to the farmers. The next few months the W4RA team will elaborate the voice-based application on meteo for farmers in Burkina Faso. A pilot will done together with Réseau MARP and the farmers-innovators. To be continued…..